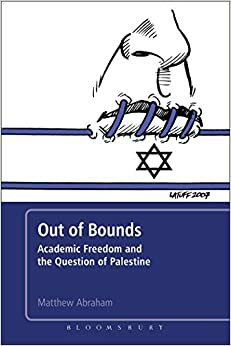 Out of Bounds: Academic Freedom and the Question of Palestine, by Matthew Abraham. New York: Bloomsbury Academic, 2014. vii + 261 pages. Appendices to p. 373. Index to p. 379. $110.00 cloth, $29.95 paper, $25.99 e-book. Matthew Abraham’s Out of Bounds arrives at an opportune moment. Not long after its publication, Ohio University student council president Megan Marzec was pilloried across the country (and by her own university’s administration) for spoofing the Ice Bucket Challenge by pouring a bucket of fake blood on her head to protest Israeli aggression during Operation Protective Edge. Rev. Bruce Shipman “resigned” as priest-in-charge of Yale’s Episcopal Church amid public outrage against his suggestion that Israeli violence might be partly responsible for rises in anti-Semitism. And I was dismissed from a tenured position at the University of Illinois for tweets critical of Israel. It is to Abraham’s great credit that he perfectly anticipates these events—all of which warrant inclusion in any subsequent edition—by so thoroughly exposing the strategy and rhetoric of pro-Israel activism on campus. Primarily using a series of case studies, Out of Bounds explores the implications of this form of organizing on academic freedom and open debate in the United States. His overarching argument is that Palestine has repeatedly been attacked as a geography “out of bounds” of respectable scholarship; it therefore acts as an avatar of restricted academic freedom. Much of Abraham’s analysis focuses on Norman Finkelstein, who was denied tenure in 2007 by DePaul University in Chicago in a high-profile (and controversial) case. DePaul apparently caved to pressure led by Harvard law professor Alan Dershowitz, who constructed Finkelstein as an anti-Semite, and rejected Finkelstein’s promotion based on his lack of “collegiality.” Abraham is now an associate professor of English at the University of Arizona, but at the time he taught writing, rhetoric, and discourse at DePaul. His insight into university governance and the major players involved is evident throughout, and he concludes that “Finkelstein’s tenure denial . . . left many observers of the American academic scene (as well as other spectators) aghast at DePaul’s seeming complete disregard for due process and academic freedom protections that serious scholars are supposed to enjoy” (p. 35–6). This episode produces intriguing reading, but Abraham is no gossip or demagogue. His analysis is always scrupulous and he avoids attributing actions to anybody absent hard evidence. Therefore, his clear sympathy toward Finkelstein and disapproval of Dershowitz’s behavior is impossible to see as anything other than a justified authorial convention. Furthermore, Abraham frames the incident within a broader pattern of Zionist harassment, illustrating how easy it is to conceptualize criticism of Israel as inherently uncivil. After examining two more high-profile incidents—criticism of Joseph Massad at Columbia University in 2004–5 and the backlash against Walt and Mearsheimer’s The Israel Lobby and U.S. Foreign Policy (Farrar, Straus and Giroux, 2007)—Abraham examines the careers of Edward Said and Noam Chomsky, probably the two most famous academic supporters of Palestine. Though Said faced constant harassment from political opponents who never tired of trying to get him fired, Abraham concentrates on Said as an academic symbol of theoretical relativism (a position, as Abraham notes, Said would have rejected). Abraham examines the effects of 9/11 on the practice of cultural criticism, invoking Said to illustrate how useful his insights around Arabs and Islam could be in contradistinction to the reductivist forms of sloganeering he was often made to embody. Said, Abraham concludes, encapsulates all that makes academic freedom worth saving. In the chapter devoted to Chomsky, Abraham largely treats the famous linguist as a commenter on the role of intellectuals in industrial Western democracies. This reading is frequently omitted in discussions of Chomsky, yet Abraham astutely shows it to be crucial to the issue of academic freedom and Palestine. Abraham focuses on analyzing Chomsky’s criticism of professors and academic institutions, which he sees as complicit in the U.S. government’s malfeasance. For Chomsky, modes of repression in academe can be self-regulating through both consent and conscious adherence to the lucrative habits of appeasing power. According to Chomsky, the suppression of Palestinian voices exists deep in the governing structures of academe. Of particular interest are the three appendices Abraham includes, one of which transcribes separate conversations between Chomsky and Finkelstein and scholars of rhetoric. These exchanges expose a stark contrast between the confident moral language of both Chomsky and Finkelstein and the theoretical complexities of humanistic discourse. For example, Palestine is “complex” usually when somebody wishes to forestall blunt criticism of Israel. This engaging and instructive illustration shows a fundamental conflict between the slow pace of academe and the intensity of activism, supporting a major strain of the book’s overall argument. Scholars and activists working on Palestine have been complaining about restrictive university governance for decades. Therefore, it is important that a study systematically assessing those restrictions has been published. Even better, the study is intelligent, rigorous, and meticulous. Abraham often deploys the specialized language of his field, but I doubt any educated reader will have difficulty understanding any of it. In this way, Abraham’s work satisfies the imperatives of both academic complexity and activist urgency. I enthusiastically recommend it. Steven Salaita is an independent scholar.